IMPORTANT - Kindly book accommodation and register for the workshop through the AEM2018 website﻿. The entire hotel is reserved for the workshop in the period 17-20 of June, so if one tries to book through the official venue website it would show up as full. Also note, that registering through the AEM2018 website is the only way to get AEM2018 room at a favorable rate. Accommodation is arranged at the hotel venue, Hotel Koldingfjord. The room with three beds should be reserved for students and others on a small budget. You book when you register, and booking is on the first come, first served principle. 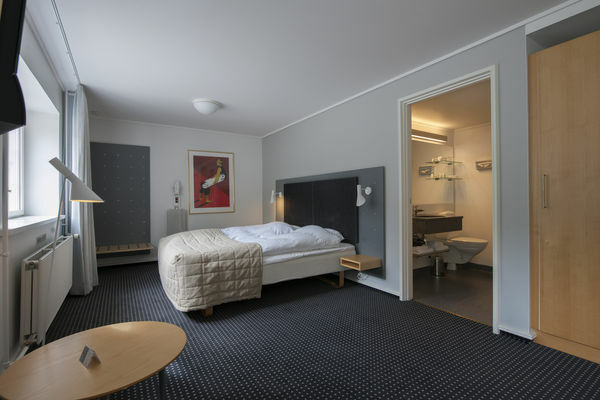 Images of all available room types can be viewed at the Hotel Koldingfjord site. In case of more participants than beds at Koldingfjord, alternative accommodation will be arranged in Kolding, just 5 km away. Image of one of the double rooms.